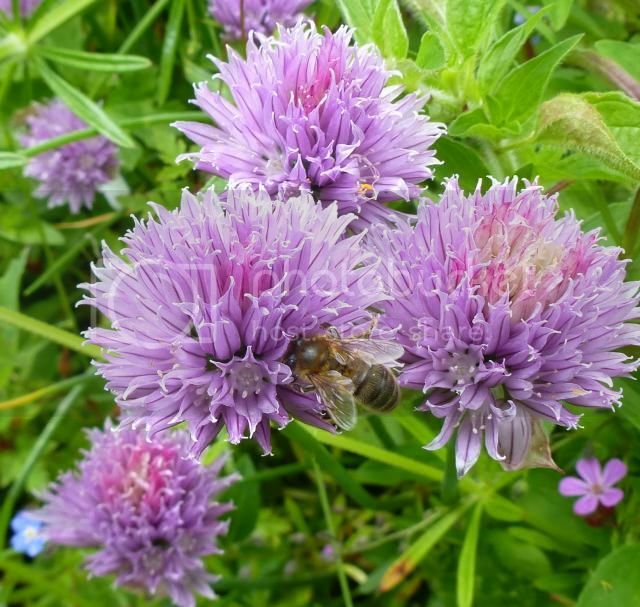 Summer and Autumn plants for honeybees. 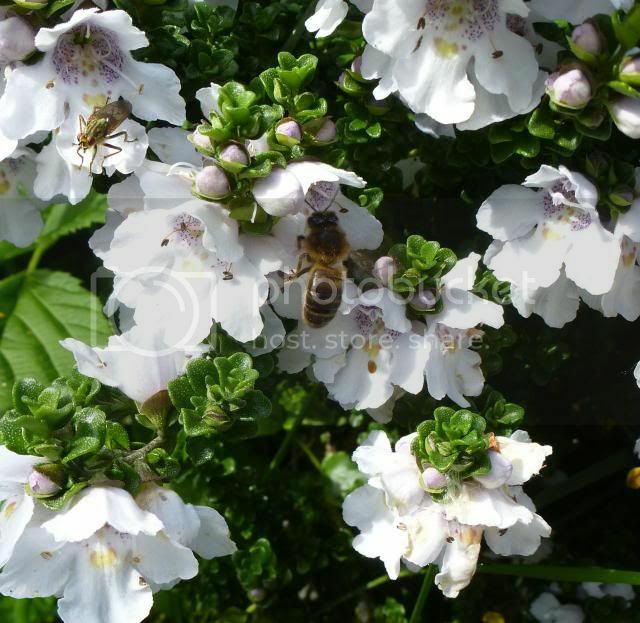 Posted: Fri Feb 21, 2014 7:56 am Post subject: Summer and Autumn plants for honeybees. Please only name plants (or post a photo of plants) that you have actually seen to be good nectar or pollen plants for honeybees. Would anyone from the southern hemisphere like to share what your bees are enjoying currently? My number one plant of the whole year for my locale is Himalayan Balsam, which flowers late summer. Obviously it's a non-native, invasive species here, but my bees absolutely thrive on it and it thrives as a result of my bees. I am convinced that this is why my bees overwinter so well, as the nectar flow never seems to fail, so it is pretty much guaranteed winter stores. They work it for pollen too of course. Dirty white pollen and bees come back with a covering of it over their backs.... it is a tell tale sign that your bees have found and are working this plant if they start turning white. I used to hate this plant and now I absolutely love it. Meadow sweet is another one for this time of year, although they don't work it as strongly as the balsam. Pollen is very pretty lime green and they work it for nectar too. Since this is a native wild flower I would imagine it is ok to propagate this one.... my bees certainly do their bit increase it's occurrence here. Actually since I started keeping bees the landscape around my house has changed and most of the plants that are prolific are those the bees work, so my view is that the bees have increased the plants that are beneficial to them at the expense of others. This has happened over 15 years but in an area that is wild it has made a dramatic difference. Natural selection in action! 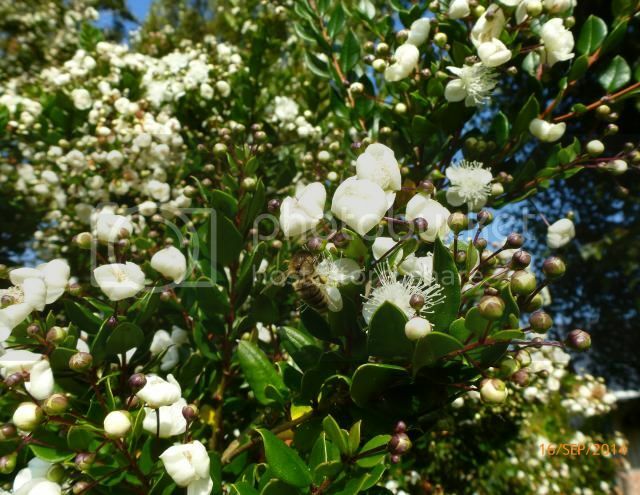 This is a list of NZ native bee friendly plants. 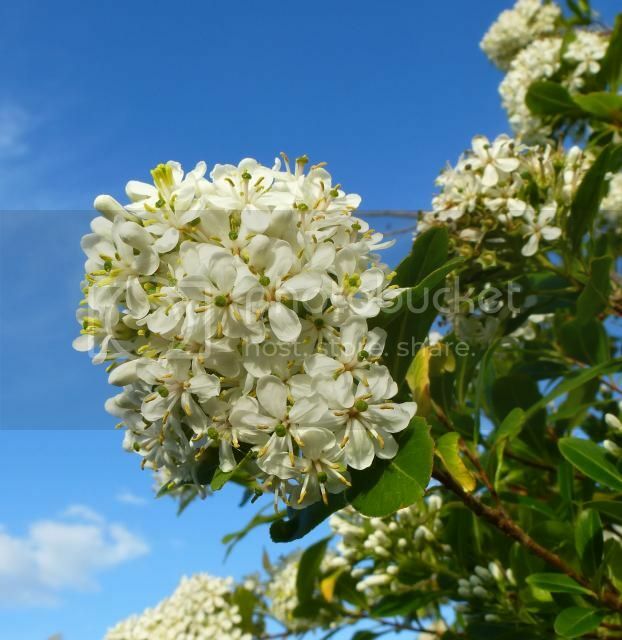 Common name, botanical name, description and height plus months of flowering. Late summer/autumn for me is the ivy. three years ago on one of my three nationals they filled a super including drawing comb in 6 days. on day 8 it was solid! Local wisdom suggests it granulates in the bee on the way back to the hive. From early/mid Spring and right through Summer, up to 6 months of flowering (in a good year) of a flower that honey bees love to visit....... it is hard to beat an Escallonia hedge. Lavender and Lilac are good hardy plants that suit our climate well and produce good Summer long flowering seasons, honey bees and Bumbles both love visiting these in our garden. Well, Barbara, you nearly had me searching for Him. Balsam seed sources, credit card in hand. After looking over its optimal growing conditions, however, I decided to wait. Reservations are that I have no water course within my "metes and bounds" but a nice creek runs right along neighboring properties and I'd rather not see that waterway get overrun by something I'd imported. As a late blooming perennial shrub/ bush, what continues to look very promising is Caryopteris x Clandonensis aka Longwood "Blue Mist". HEAVY floral density, deer repelling, adapted to a large part of the N. American continent and, of course, late blooming, are it's main attractions. But it's fairly expensive which means a long time to get a significant stand propagated and established. In the meantime, Goldenrod remains the abundant late summer/ fall standby for much of this continent. It's free, it's wild, it's everywhere, and bees love it. 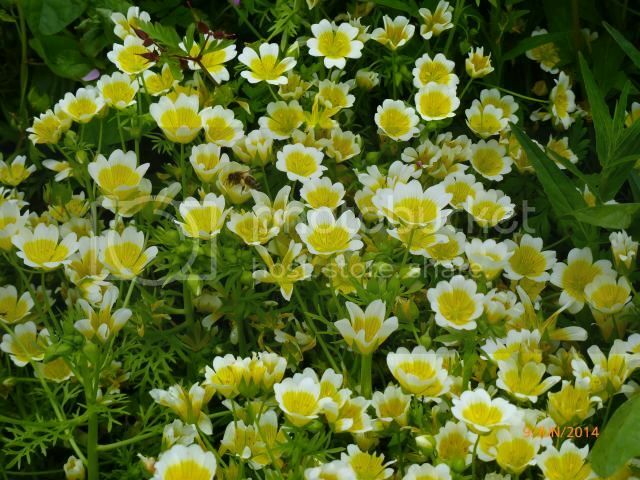 We have had very dry weather so most of the overwintered poached egg plant/ meadowfoam has finished up after flowering spectacularly for about a month. This is my best bee magnet when it is in flower. 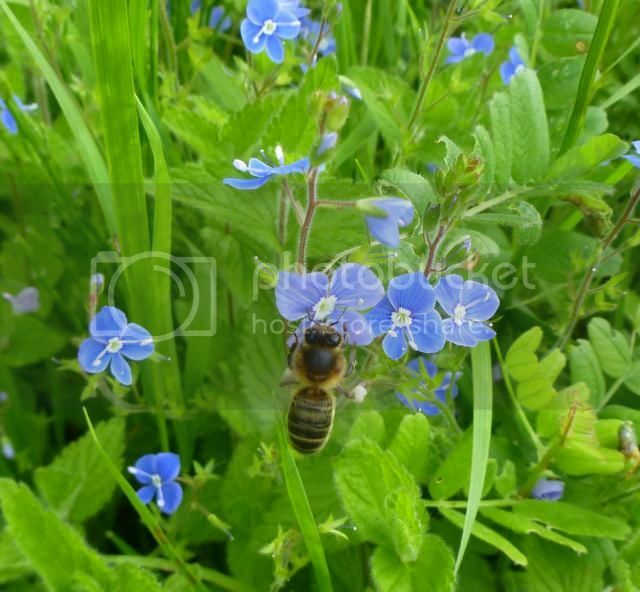 We have a good spread of speedwell in the meadow and the bees have been enjoying it. This is the crimson clover growing as green manure in the veg. patch. Field clover/white clover is in flower now too. The chives attracted a few honey bees, this was a couple of weeks ago, they are finished but will probably give a second flush later. This morning honey bees were visiting a rose which is rambling up a hedge. I often see bees investigating plants around the garden. I am still so busy planting! When a plant is really loved my ears can tell before my eyes will see! Back to main topic—a question: I've been wondering about the various clovers, especially both white and yellow sweetclovers and crimson clover. Around here there's only the ubiquitous white and 'red' clover in quantities sufficient to attract observable bee interest. The red of course is no good for honey bees due to its flower depth, and the white just doesn't seem to pull the girls in from afar; at least not like wild mustard, chicory, tulip poplar blossom, bradford pear, etc. Could you compare and contrast your experience with the crimson clover, and any other clovers you might have about? Good question. We have the red clover and white clover as wild / naturalised plants here. It is true that the white clover is less of a magnet than I had expected but I wonder is it related to temperature, ground moisture and other plants in bloom at the time of observing- also time of day as a factor. 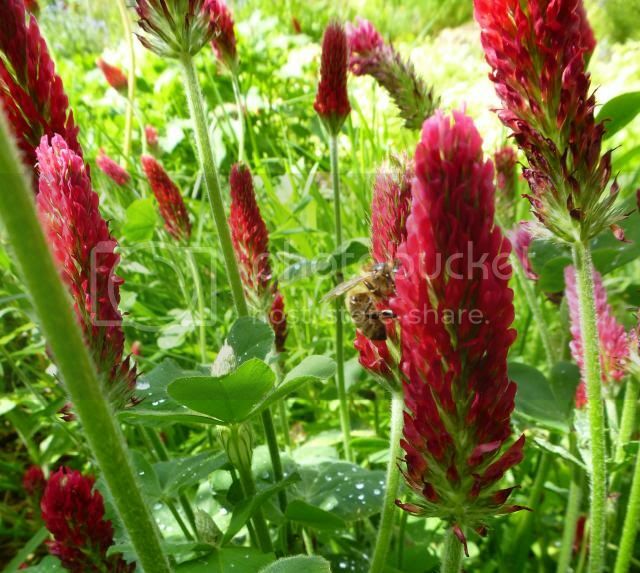 The crimson clover I have planted in the vegetable garden, it flowers for a month or so. I am always planting some as the bumble bees like it too, but the honey bees are not visiting the current patch as much as they were visiting a different patch a few weeks ago. I haven't planted the yellow sweet clover, I would love to hear from anyone who does grow it. I did grow trefoil, or yellow hop clover, over winter, it flowered through May and June and the bees did visit it but I thought it was disappointing, a few honey bees and a few hover-flies. Australian mint. This was taken a few weeks ago and the first flush of flowers is now over but it will continue to flower (a little less prolifically) all summer. LOVED by bumble bees, hover-flies, wasps! and honey bees! I am very curious about bees ability to self-medicate. Other animals do it, It is obvious with hens and cows, how if they have herbs and wild plants available they will sometimes choose odd things. 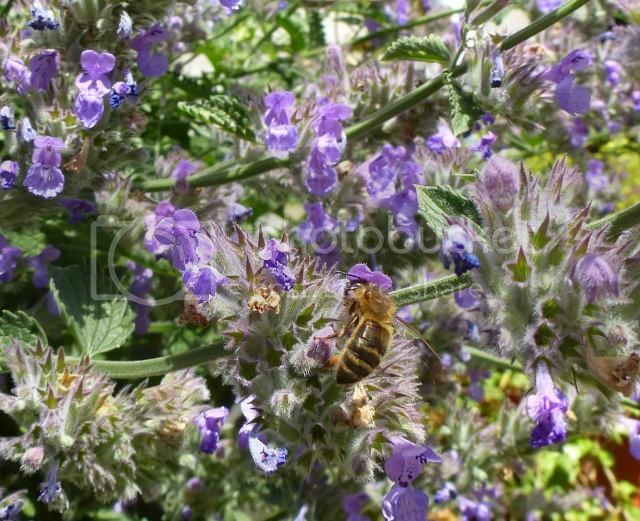 Today the honey bees were on thyme and I see I didn't mention phacelia in my last post. I repeat sow phacelia too in any spare areas. The blackberries are considered to be the main flow here, although we have LOADS of brambles I am still SO busy planting (and swarm catching) that I have not taken the time to observe them. Kim, having flown over to enjoy the Irish Summer, I have been observing the local bee population around the inlaw's garden. One surprise was to find a type of Fuscia plant common in NZ growing here and attracting both the small black honey bees and the buff tailed bumbles. I was not aware the species was available here as a garden plant. Will have to see what I can do with the camera to capture the visitors to the blooms. Thanks for that JSmith, Fuschia does grow very well here and has even naturalised in some areas, there are lots of different kinds so it will be great if you can get a picture, I will keep an eye on ours too. Here the bees are enjoying the leek flowers, the borage and the poppies. 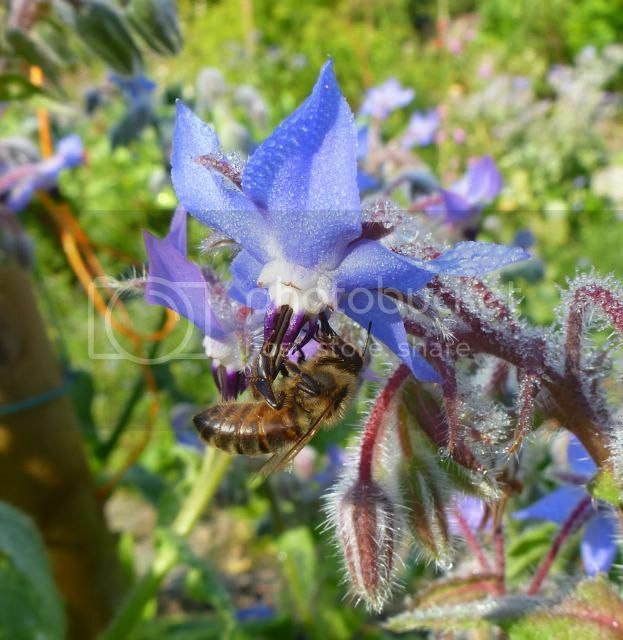 The Echium "blue bedder" that I planted is in full swing and is now attracting lots of honeybees, they seem to be collecting (edit) POLLEN at this time. 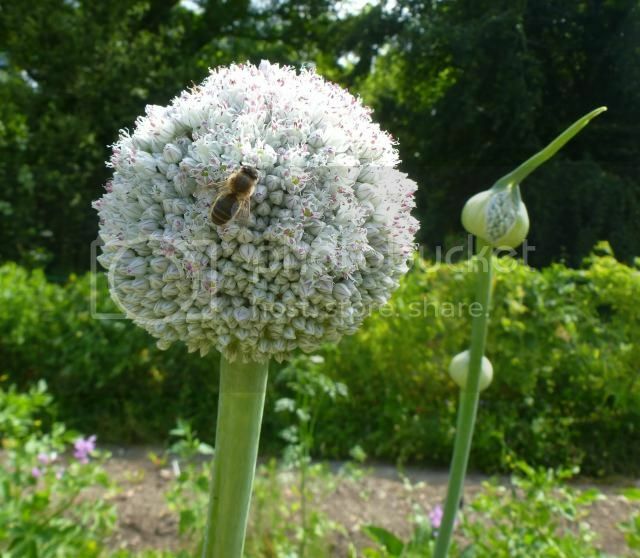 The leeks have not had so many bees over the last few days and I would rate them poorly overall this year. However the Echium, Borage and Poppies have been very busy. White clover is not as busy as usual but the weather has been very dry. The blackberries are probably the main forage right now, there are SO many brambles in all the hedges and woodland edges. 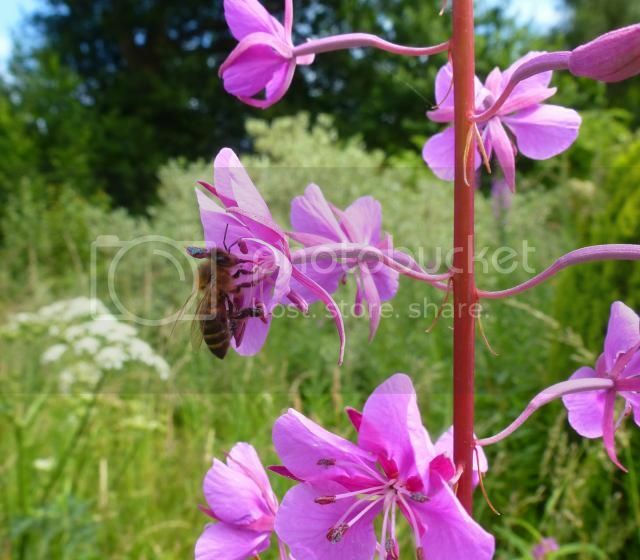 There are also large areas of Rosebay Willowherb nearby including good patches in the garden, it is such a lovely flower and loved by the bees. Back home in NZ now, temperatures are much different! Having just experienced a Summer Ireland can be proud of. Looking through photos, there are not really any good ones of bees actually working the flower blooms, but this is the Fuscia plant the liked best. 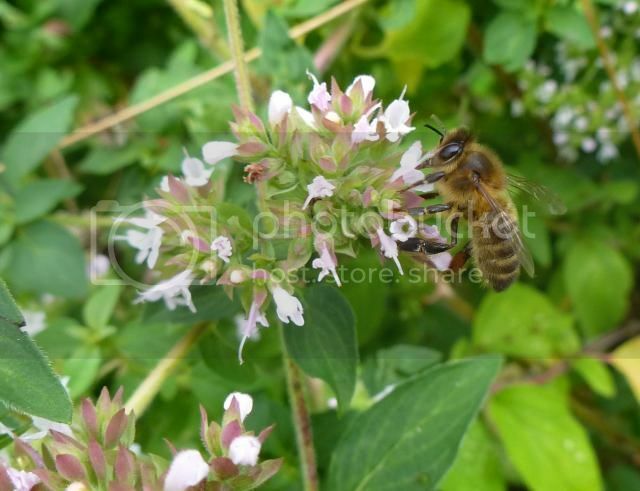 Bumble bees and honey bees are really enjoying the oregano that is self seeded in a patch of weeds next to my hives. It's not often they forage on the doorstep but it's good to see them enjoying my garden even if I didn't intentionally plant these for them. It must be at least 7 years since I sowed the oregano seed and it's slowly spreading through that patch of weeds and holding it's own. Another case of the bees doing the gardening on a patch that I have neglected. J Smith, yes we have had a wonderful summer so far. Local beekeepers here say it is the best honey year for 30 years with huge yields. 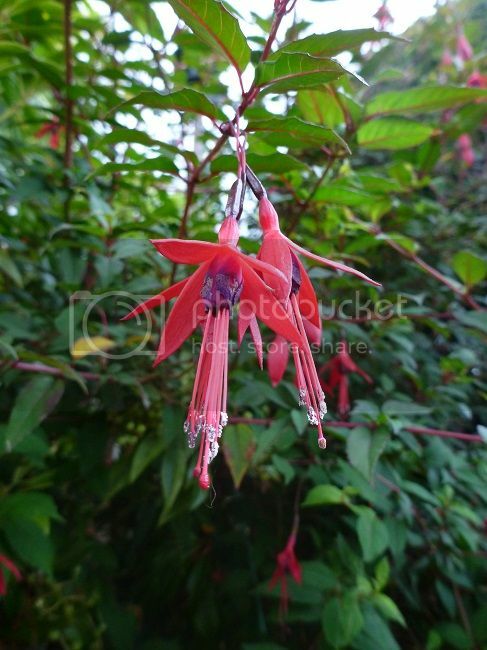 Great photo of the fushia, good to see which variety they liked. Barbara, the oregano / wild marjoram has really caught my attention this year, there is such a buzz from the plants. It is a wonderful bee and butterfly plant and a great self-seeder for me too. The plants have flowers varying in colour from almost white through pale pink to deep pinky-purple. This photo doesn't do justice to the masses of blooms on the plant. Ornamental alliums have been good. 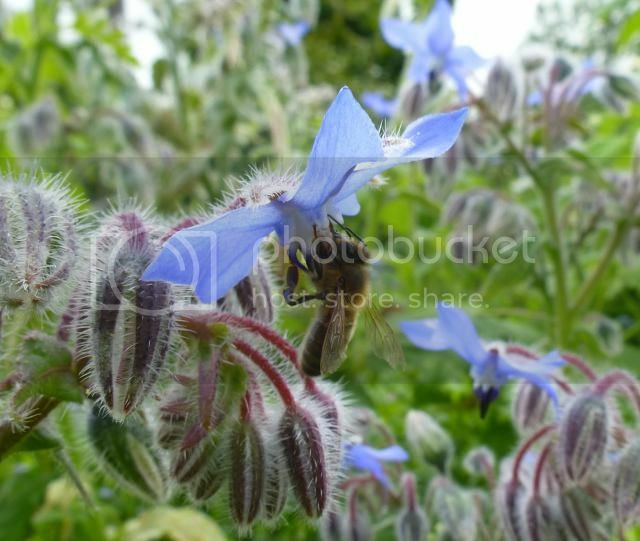 Borage is such a good and continuous annual bee plant and a wonderful self seeder. Since planting it for the first time 16 years ago I have not planted it again since, although I do sometimes transplant self-sown seedlings. This photo includes morning dew. 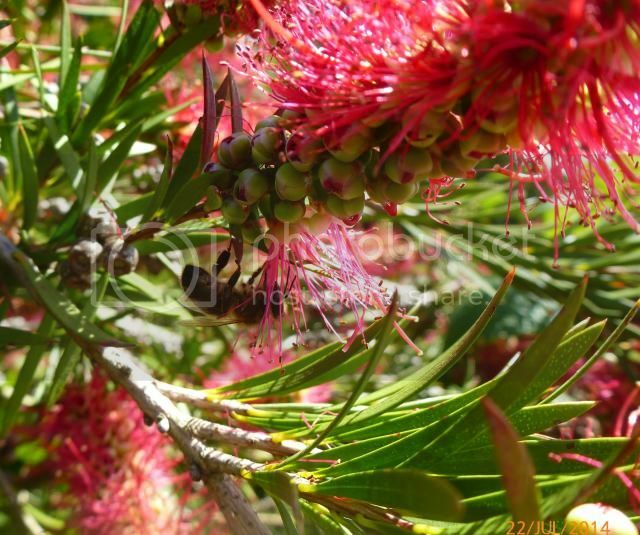 Callistemon or bottle brush, Not a very hardy plant if you have cold winters, but loved by bees, bumble bees and wasps. Catmint or Nepeta. 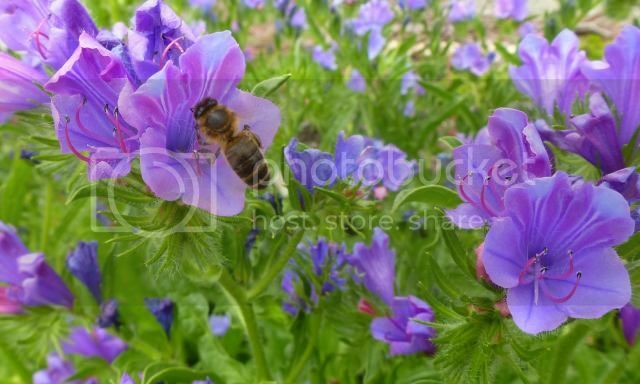 this has had regular honeybee traffic and has a very long flowering period. The leeks are still flowering and have turned out to be very good after all. Rose bay willowherb is spectacular in the fields and there are still some brambles flowering. 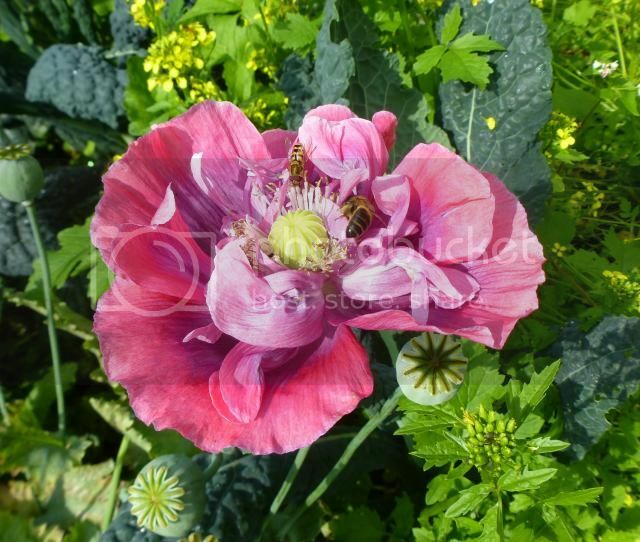 Poppy, I generally encourage the single flowered forms, but the bees do manage if there are not too many petals. Great self-seeders. They are just about finished now, this photo is from August. 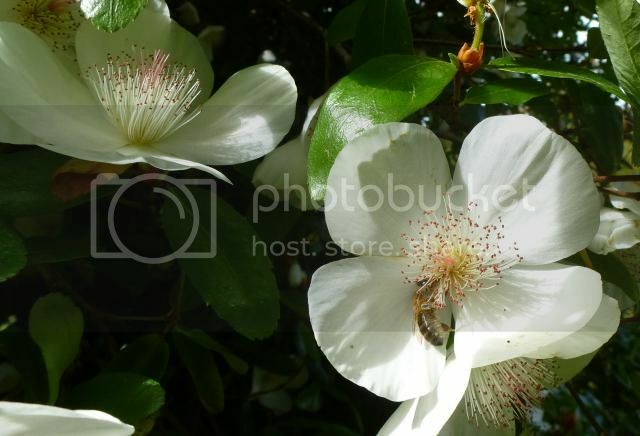 Eucryphia has flowered all through August and into early September. It is Covered in flowers, honeybees and bumblebees every time I look. 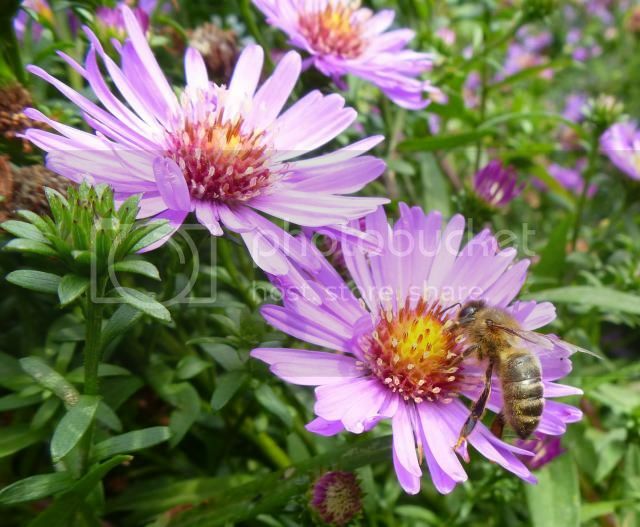 Aster is a spectacular bee plant for autumn. 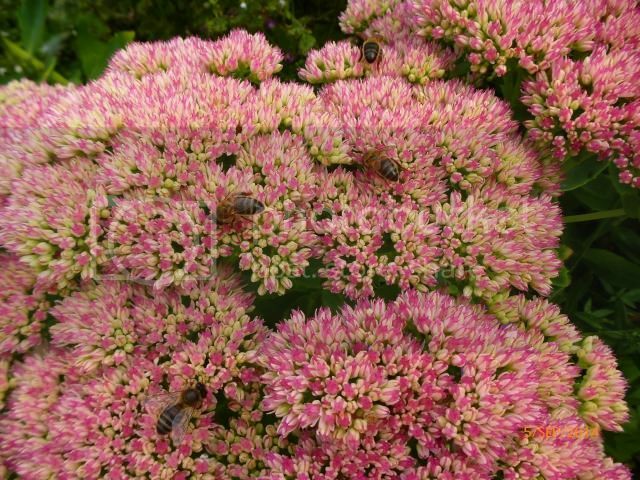 Sedum, this one is the classic autumn joy, is another plant for reliable autumn forage. A small ornamental chestnut provided forage for a week or two in August. The mints, oregano, borage, echium "blue bedder" and phacelia are all soldiering on. Its fruit is appreciated in Chile and Argentina and its flowers are important for honey production. The Chilean myrtle has medicinal uses for the Mapuche people..... It has become naturalised in parts of Ireland and western Great Britain and it has been planted in Spain. There has been an excellent buzz from our myrtle over the last week. The buzz from a plant bees are really loving is similar to a swarm buzz, it is so uplifting to the spirit. Please don't plant or encourage himalayan balsam! It's a non-native plant, dangerously invasive in water courses and there is a real need to eradicate it as far as possible. Although it is a great bee plant so is orange balsam, touch-me-not balsam and small balsam. Touch-me-not is native and the other two are now semi-native; none are damaging to water courses. How to tell the difference? Himalayan balsam has pink-purple flowers and is a large plant compared to the others; its leaves are paired each side of the stem, which is red flushed. Orange balsam has smaller orange flowers, touch-me-not is yellow, whilst small balsam has little pale yellow flowers. 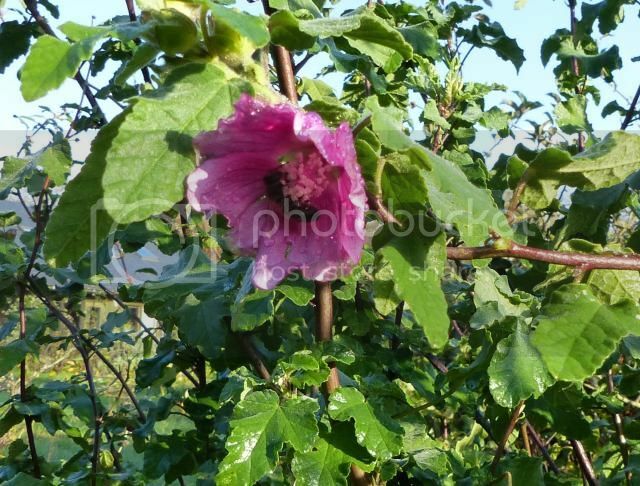 All three have leaves that grow singly on the stems. By the way, if you like your Latin (or your New Testament!) the botanical name of touch-me-not is impatiens noli-tangere! Please don't plant or encourage himalayan balsam! I don't need to encourage Himalayan balsam as my bees are a much better work force at it..... you try telling them not to, but I can assure you they will not listen. In a world where man and agriculture has ruined natural forage for insects in many areas, can you really deny the bees such a wonderful unpolluted crop to feast on. Erosion of riverbanks and the landscape in general has been going on for millennia..... it is a natural process and it will continue to happen with or without balsam. Species spreading to new areas and adapting to new climates is also a natural process.... yes this one has been helped by man, but how different is it compared to using birds or the wind to spread. I would imagine a good percentage of the plants and animals in this country are non native..... we are, non native for that matter and VERY invasive! The potential threat of flooding really only poses a problem to mankind and is man made to a large extent..... too many roads and houses that surface water runs off rather than being soaked up, forests cut down and poor soil caused by intensive farming. Nature is a dynamic system. We need to stop fighting it and work with it. See and make use of the benefits it provides rather than try to kill or control it because we think we know better. It will have the better of us in the end, if we don't learn to live more in harmony. The other varieties you mention do not thrive in this area as Himalayan balsam does. Natural selection is taking place. There are many other species of plant that survive and thrive amongst the balsam, it just takes time for them to find a balance, rather like varroa and bees. I am sure there will be pockets of ground where the conditions will favour the other native varieties, but here the Himalayan rules and trying to encourage the others might be rather like spitting in the wind. I make these comments as someone who lives in the very bottom of the valley and understands the very real risks of flooding. I don't know why you feel you need to be quite so offended about it, Barbara! I was only pointing out that there are other considerations to think about; nothing comes totally without a price. Of course there are many other causes of all our ills but if we can avoid one more..... We live on a river bank and orange balsam is flourishing here and just as loved by bees. If one can find or encourage a better alternative that must be a good thing, surely, and seeds are available for these safer varieties. Perhaps we will just have to agree to differ on this one! Sorry if I was a bit forthright with my views. It is obviously something that I am quite passionate about. Like Phil, I believe that Himalayan Balsam gets unjustly bad press and I clearly feel the need to jump to it's support when I see it attacked. I do so in order to hopefully make people stop and consider that there is another side to the argument. I am pleased to hear that native varieties are flourishing where you are. I will do some research on the ones you suggest and look out for them locally. No problem, Barbara and I have folowed Phil's link and read it with interest. However, I do know that, when we first came to live on our river in 1985ish the flora was very diverse. We then had an outbreak of HB which completely smothered everything else; for two or three years it was all that grew along in front of our house. Anglian Water had a campaign to remove it and replace with orange balsam and touch-me-not which has resulted in both of these varieties flourishing, along with the return of many other plants like meadow sweet, self heal and purple loosestrife. It seems a good thing to encourage this. I don't deny that HB is probably over-demonised (if there is such a word) but our river is the better for more biodiversity than it often allows if it becomes rampant. Barbara lives near the bottom of a valley, Liz (Nannybee) lives in the fens - there's nothing to stop flooding there! Himalayan Balsam thrives here alongside many other plants. You don't see any sign of it until late June or July, after most of the natives have grown to their full height and flowered. Then it comes through, and adds a pleasant range of pinks to the diminishing colour range, flowering alongside rosebay willow herb and purple loosetrife, right through August and September and often into October, with sometimes a few in November if the frost is late. Then it dies down to a mulch, which presumably fertilizes other plants, as this has been going on for many years, without any indication that they are crowding anything out, thanks to their open habit and big gaps between plants. They provide a welcome late feast for a huge variety of insects, including honeybees, bumblebees, butterflies and moths. Their seeds taste good - a little like hazelnuts - and apparently can be dried and ground into flour. I see no harm in them at all, and a great deal of good. For the record, we don't have Himalayan balsam in my locality. If it is in your area then by all means hold your own views based on your observations, but in my opinion some places that do not have Himalayan balsam and may have sensitive Eco-systems could be greatly disrupted by the introduction of such a vigorous invasive species. Nasturtium has been in flower for months but only since late September have I seen the honeybees on it. 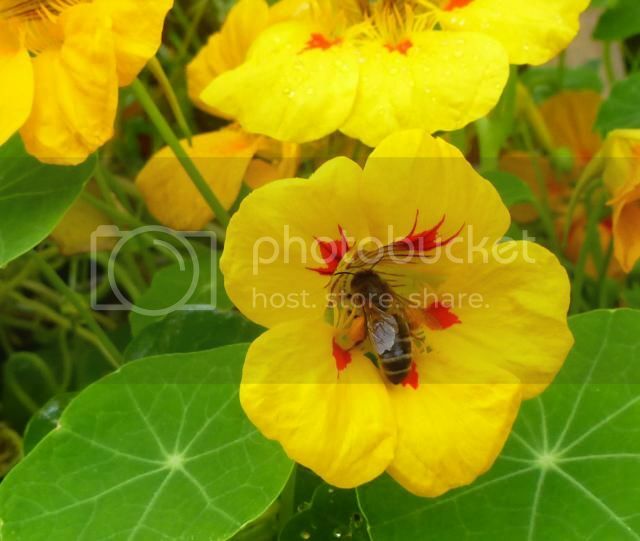 They have been consistently gathering pollen from the nasturtium over the last few weeks. 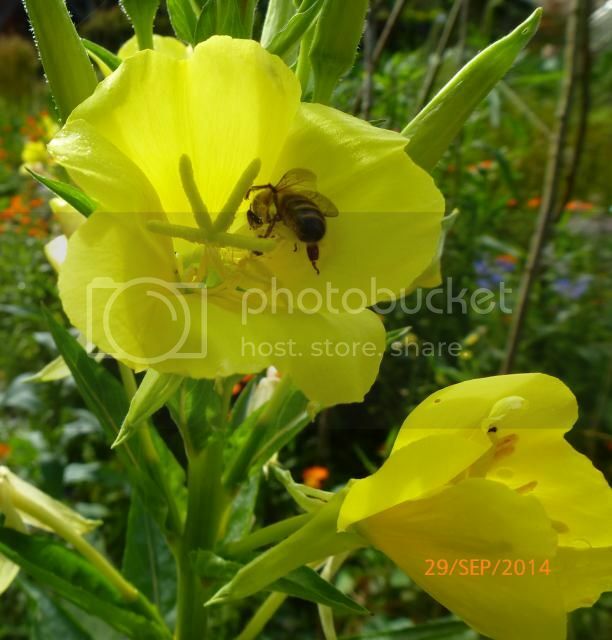 The evening primrose is another great self-seeder and the bees seem to love it. Rosemary This photo is from October 1st. 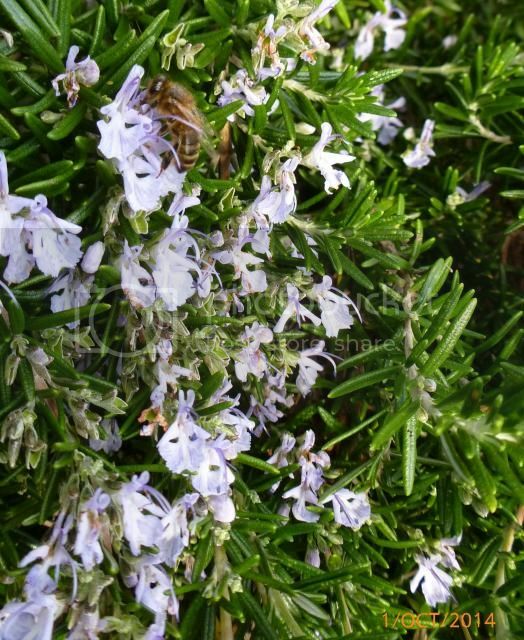 Last winter/spring, the bees were on the Rosemary until May, 8 months of bee forage, 4 months without flowers, need I say more? 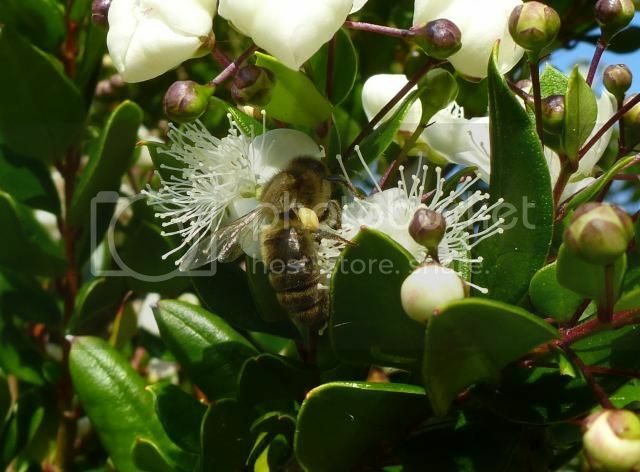 This is escallonia bifida, covered in honey bees throughout September and early October. The Chilean Myrtle is still going strong as are borage, phacelia and echium. The mints, oregano, aster and Sedum are finishing up. The first 3 weeks of November were very wet (and mild), the bees were out during any sunny spells. The nasturtium has been a good source of late pollen and bees were still finding pollen there last week although it has now been hit by frost. Ivy is the main stay at this time of year. November 20th. 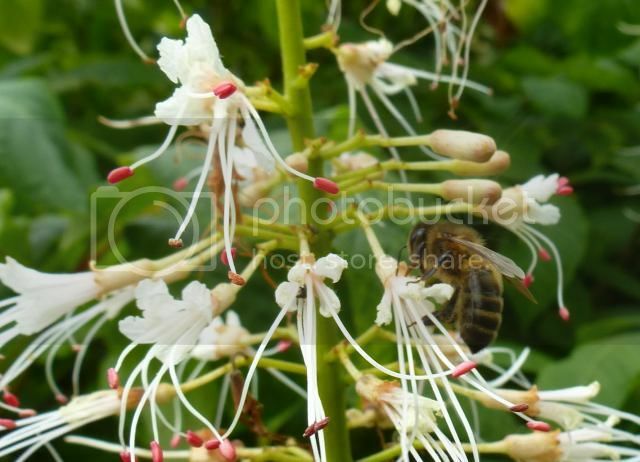 I have had help from the Irish garden forum to identify this flower, I had seen the bees on it earlier in the year too. 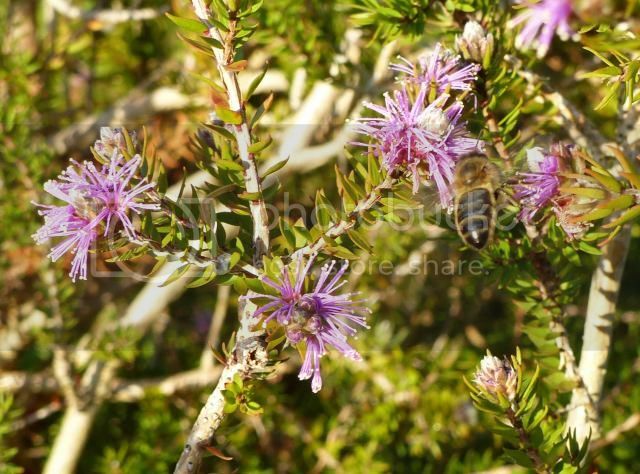 It is Melaleuca squamea, with the appropriate common name - honey myrtle. Didn't have camera but an allotment full of mustard grown as green manure and allowed to flower had my bees foraging on it yesterday. I've been reading Dzierzon's 'Rational Beekeeping' again - for about the tenth time - and today I focussed on his recommendation to plant Phacelia Congesta, as he claims it flowers as late as October, and sometimes even into November. So - I've been trying to source some seeds - but the only supplier I could find is in the US, and importing from there is a mighty hassle. It has quite a few alternative common names: Spike Phacelia, Spider Flower, Wild Heliotrope, Blue Curls, Spike Scorpionweed, Hook, Caterpillars & Fiddleneck. I can't easily source Phacelia Congesta, but when I looked-up 'Fiddleneck' (supposedly one of it's common names) - every man and his dog is selling those seeds - under the name 'Phacelia Tanacetifolia' - only some seeds are being advertised at £6 for many thousands (as green manure) - and yet others are being advertised at around £2.50 for 25 seeds - as if they are something special. So - are these seeds all the same, or what ? 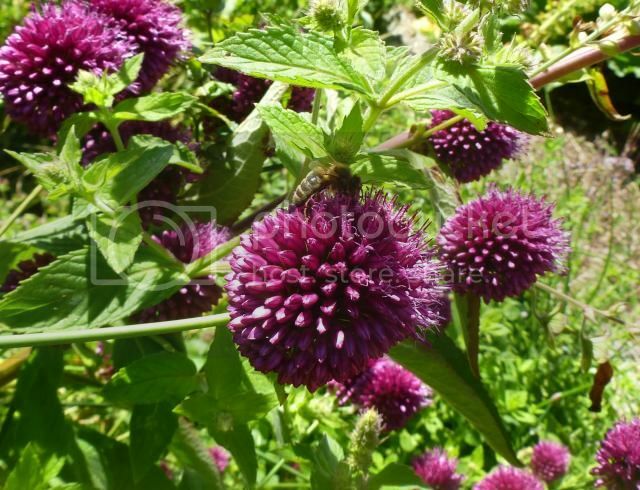 Here's another picture of supposedly the same plant - but to me it looks very different. If anyone can shed some light on this it would be much appreciated.